Climate FAIL: Governor 'Moonbeam' Brown's 'denier page' can't even get the temperature graph right | Watts Up With That? UPDATE: 8/20/12 3:50 PM PDT The Governor’s office changes the page – see below. I’ve been sitting on this one quietly for almost a week now, and nobody seems to have caught this glaring error in California Governor Jerry Brown’s new climate “denier slamming page” put together by the Governor’s Office of Planning and Research. 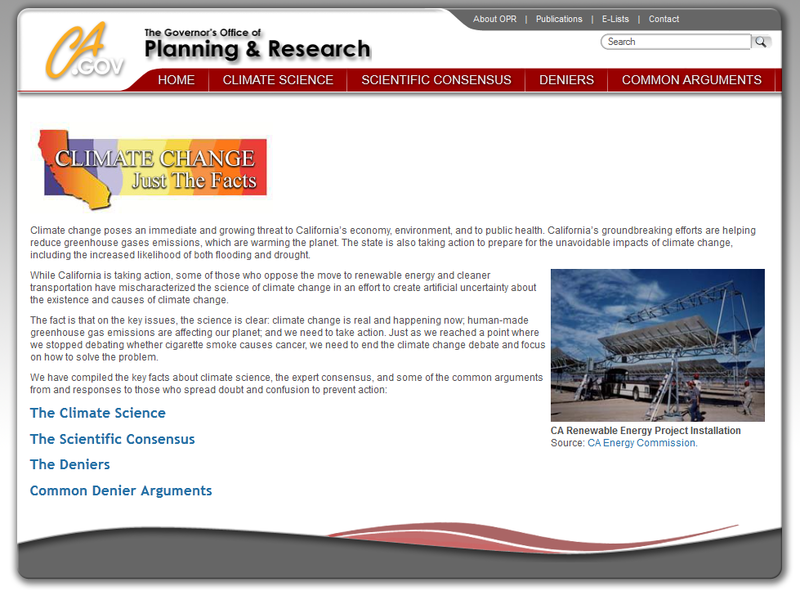 Somebody working for Governor Jerry Brown (of whom, let me be quick to say, I am a fervent long-time admirer) has slapped together a page about climate denialism as part of an official State of California website about climate. 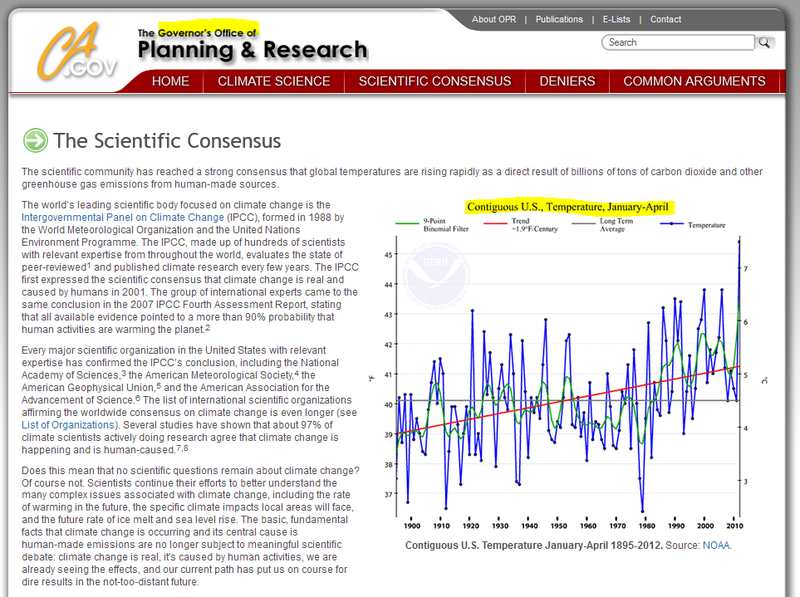 Note the trend is 1.9°F/century ( 1.055°C/century) in the graph shown on Brown’s “consensus page”. That’s waaay too high. More on that in a bit. 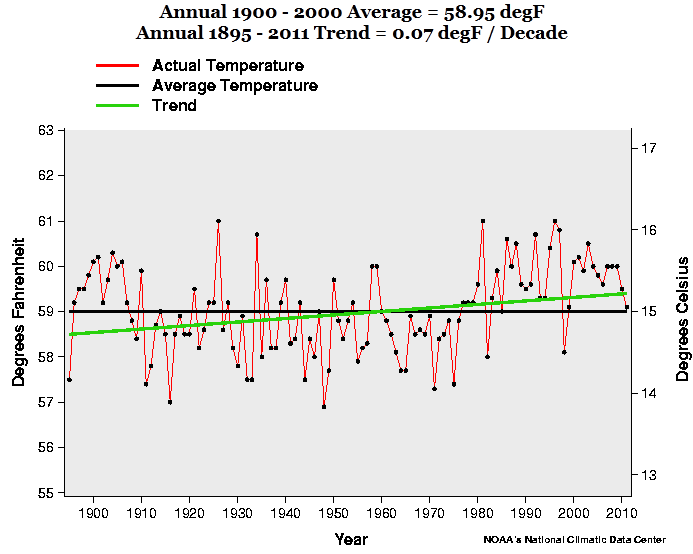 The graph they show for the USA is for only one third of the US climate data, from January to April. WUWT? Note the trend of 1.25°F/century or 0.694°C/century. While it is a US value only, it is fairly close to the generally agreed upon ~ 0.7°C/century trend for the globe as cited by the IPCC. If the reverse had happened, such as some “denier” plotting just a few months of the surface record from 1895-2012 without a caveat as to why it was presented, perhaps showing a cooling, the alarmosphere would have a collective “denier” cow. Laughably, nobody seemed to have noticed it when Moonbeam did it. Further, since this was put together by the Governor’s Office of Planning and Research, you’d think they could have researched this given the IPCC references on that page. Clearly, they were using the IPCC as the authority for their argument. Eleven of the last twelve years (1995–2006) rank among the 12 warmest years in the instrumental record of global surface temperature (since 1850). The updated 100-year linear trend (1906 to 2005) of 0.74°C [0.56°C to 0.92°C] is therefore larger than the corresponding trend for 1901 to 2000 given in the TAR of 0.6°C [0.4°C to 0.8°C]. The linear warming trend over the last 50 years (0.13°C [0.10°C to 0.16°C] per decade) is nearly twice that for the last 100 years. But what the hell do I know? By pointing out such things, I’m just a “denier” according to Governor Brown. Nah, not alarming enough, especially with 2011 being at the normal temperature line. But, any of those alternate graphs I’ve shown, using the whole year, not just 4 months of data, would have been acceptable for Governor Brown’s “denier slamming page”. I find it to be exquisite irony that a “denier” (by his definition) has to point this out. Even though he didn’t spot the wonky graph, I’ll give Michael Tobis credit though. With incomplete misleading graphs like the one they used it sure does look “slapped together”. Thanks again for reviewing our “Climate Change: Just the Facts” website. We followed up on the issue that you raised and discovered that, as you pointed out, one of the charts on our website shows only one scenario, while the tool we link to can provide a range of scenarios for data from 1885-2012. Rather than show one data set, we have instead decided to remove this chart and link directly to the resource. We hope people viewing our website will explore this resource to see wealth of climatic data that has been collected. You get what you deserve with Gov. Moonbeam. Suckers. Wrong? Doesn’t matter. It repeats and advances the lie. The only way to fight this stuff is to keep a lst of the lies and every time a new one comes out republicize the full list. Beautifully analyzed! As is often the case, this simply follows the sort of pseudo-science I’ve been attacking for years in the smoking area: I’m sure you’ve heard about the tobacco companies increasing amounts of nicotine “to addict the children”? They basically took the figures from 1998 to 2006 for Marlboro and showed something like a 3% increase. Of course they had the figures for 1997 and 2007 available, but they didn’t include them. Why? Because including them would have shown ZERO increase… *not* the desired answer for the campaign! There’s another example out there even closer to your January/April thing (can’t find it at the moment) where they took economic figures for a ten month period and pretended it was the same as taking them for the full year. Since hospitality $/employment is highly seasonal the lopping off of those two months allowed them to come to a conclusion wildly at variance with reality. Unfortunately, just as with climate propaganda, the original stories by “reputable” authorities are all that 95% of the population ever sees. The problem with this advocacy is that sheeple are likely to read the Governor’s web page but not the WUWT rebuttal so they are likely to propagate the incorrect info, believing it to be correct. One might think they were intentionally trying to mislead the public. I wish there was a way to persuade both the Gaians and the skeptics that an arithmetic mean of a very large spatial system is simply invalid. You can’t improve it . You shouldn’t do it in the first place. A mean can be valid when the values are KNOWN to be tightly coupled. The mean salary of the employees of Joe’s Market is valid, because those salaries are all decided by Joe. but there isn’t a “closed-form” way to show that the mean is wrong. It’s a matter of basic judgment and understanding. When you choose to take a spatial mean of America, you’re ASSUMING that the system is tightly coupled; ASSUMING that every district is being affected by one single Joe. Trouble is, that is exactly the question we’re supposedly ASKING. We’re debating whether every place is affected by one single driver. When you ASSUME what you’re ASKING, the whole process is circular. You have to laugh at the climate mitigation section (or cry, depending on your California taxation situation). I think we should have a rolling update (like the number of meals served by McDonald’s billboards) on number of parts per million of CO2 removed from the atmosphere, and another one showing the cumulative cost, all in real time. Would the sheeple be able to comprehend it ?? Naaaaah, or is that baaaaah. It’s really not that bad for government work, they spelled ‘meteorological’ right. For tax-payer funded political propaganda it falls squarely in the middle of the bell curve. Good job Moonbeam! You’re right Bobby, one might think that. Doesn’t matter. We’re looking at California as a corpse. It’s financial state is in shambles as budget after budget over estimates the actual revenues due the state. In desperation California even bet that Facebook will generate huge revenues for the starving coffers and bet the house by including it in it’s budget. Bernie Madoff would have loved taking California’s money. I penned a letter to the Gov about his reliance on a 20 year old talking point about skeptic scientists being in a parallel situation to the ‘big tobacco expert shills’, though. Ah the perfect “Brown out”, likely from the green energy agenda!! What’s with these graphs that use only four months of data out of each year, and then plot it out for over a hundred years? That makes no sense to me whatsoever. That would be like a plot of my income on the 7th of each month for the last 25 years – a straight line at ZERO (I have always gotten paid on the first working day on or after the first/15th of each month). They could just as easily select every other month, or the first day of Spring, Summer, Fall and Winter. I could even run a computer program and select days ( all the same day of the month) and make a graph that went drastically down or up or whatever you wanted. What purpose is this information? What’s the problem? The graph is clearly labelled, head and foot. So, what’s the state of contiguous US temps since 1895, Jan to April? On the rise, it seems. And the state of the same, annually since 1895? On the rise. California? Lower trend because of maritime influence, but on the rise. The graph is not “wonky.” It would be, if it was mislabelled. Michael Tobis is probably one of the few that bothered to look at Gov. Moonbeam’s cretinous site. Of course, now all your nice charts will appear there, without thanks. Bob, how could you even think such a thing !!! No warmist politician would EVER do that !! Anthony I agree with your conclusion but I have an issue with your use of the nickname “moonbeam”. It’s ugly and reminds me of grade school. After all, he is the governor. Just as I detest the use of “deniers” I also detest the use of intentionally mean nicknames here. Rather than suspected that they were trying to intentionally mislead the public, I assume that it is more like yet another example of confirmation bias. The numbers are scary, then they must be right and don’t get looked at a second time. OTOH, a low or negative trend sets off alarm bells and further checking. There is a long history of scientist doing step by step refinement of experiments and calculations to remove “errors” — where “error” in this case is defined as “other than expected results”. Egg-on-face Tamino et al for not catching this? An old saying around the South of the US, in Southern slang–figgers don’t lie, but liars do figger. 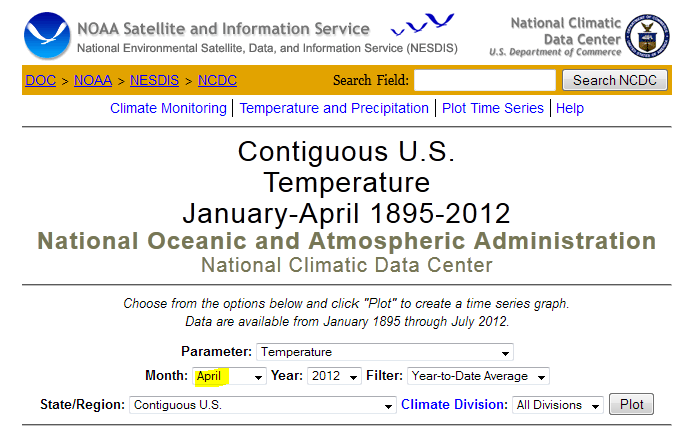 Why is NOAA fabricating ‘climate data’? Why would a government agency fabricate data? Why is a President and Governor misrepresenting data? Why does NOAA adjust the raw temperature data from the old temperature network and ignore the existence of the new temperature network? Why does Dr. Mr. James Hansen GISS despise and hate the United States of America an all of its peoples, Iowa and his parents? I long ago stopped expecting climate dilettantes to care anything about facts. Governor Moonbeam? More like Governor Moonbat, if you ask me. If I thought anyone read it, it would piss-me-off. In Illinois the Governors go to jail, for a rest from pocketing the taxpayers money. Most of them don’t even bother to insult the intelligence of half the populace. A major trick of the AGW camp is to smooth out the oscillation in global mean temperature and the corresponding forcing before the 1970s and to claim the cyclic warming since 1970s is man made. The cooling from the 1880s to 1910s are smoothed out. The warming from 1910s to 1940s are smoothed out. The slight cooling from 1940s to 1970s are smoothed out. What is not touched is the warming starting from the 1970s. This gave an exaggerated climate sensitivity of 3 deg C for doubling of CO2, when the more likely value is only about 1 deg C.
CO2 in the atmosphere has been increasing EVERY YEAR for the last 14 years, but it has refused to add any temperature above the maximum value recorded 14 years ago. To overlook this pause, they have stopped to talk about trends (climate) and have started talking about the weather with their “nth warmest in the record”. To account for the lack of warming, they now want to increase the effect of aerosols or increase the defused heat to the deep ocean in the climate models. Looking at these temperature curves annoys me for two reasons: first, they use yearly resolution when monthly resolution is available. The true temperature curve does not jump up and down like these yearly ones do but is smooth and the turning points are not sharp but curved. You learn nothing about the behavior of global temperature from this type of curve. Secondly, it is totally wrong to approximate the entire curve with a straight line. A straight line tells us nothing about the climate. There are distinct temperature regions where the physical processes are different and they must not lumped together into one imaginary pile. The trends of each of these separate temperature regions differ and homogenizing them into one straight line is incredibly stupid. They get away with it by not showing the real temperature curve or by using a running mean that destroys information. When sometimes better resolution is used people notice an apparent “irregularity” of up and down oscillations that they would rather not be bothered with. These up and down oscillations are the warm El Ninos and cool La Ninas that are part of the ENSO oscillation. The entire global temperature curve is comprised of El Ninos alternating with La Ninas, with some irregularities thrown in where oceanic phenomena have interfered. They are not some kind of external influence to be neutered but something that carries information. Their precise timing is important for understanding the alleged influence of volcanic eruptions on climate as I have explained in my book. While most of the temperature graphs you show are caricatures the one from IPCC is essentially a forgery. It is a slightly modified NOAA chart in which the presence of La Nina valleys has been eliminated and the curve is based on the tips of El Nino peaks. To get the global mean temperature in the presence of the ENSO oscillation you must first put dots at the center of each line connecting the peak of the El Nino warm period with the bottom of the adjacent La Nina period, and then connecting the dots. This choice is dictated by the fact that they must be considered part of the ENSO wave train. ENSO itself is a harmonic oscillation of ocean water from side to side in the equatorial Pacific. It is powered by the trade winds and has existed since the Isthmus of Panama rose from the sea. To give you an idea of information lost thanks to poorly represented temperature data, lets start with the twentieth century. The first ten years of the century were cooling, not warming. Then warming started suddenly in 1910 and stopped equally suddenly in 1940. There was no parallel increase of atmospheric carbon dioxide and this rules out the greenhouse effect by the laws of radiation physics. 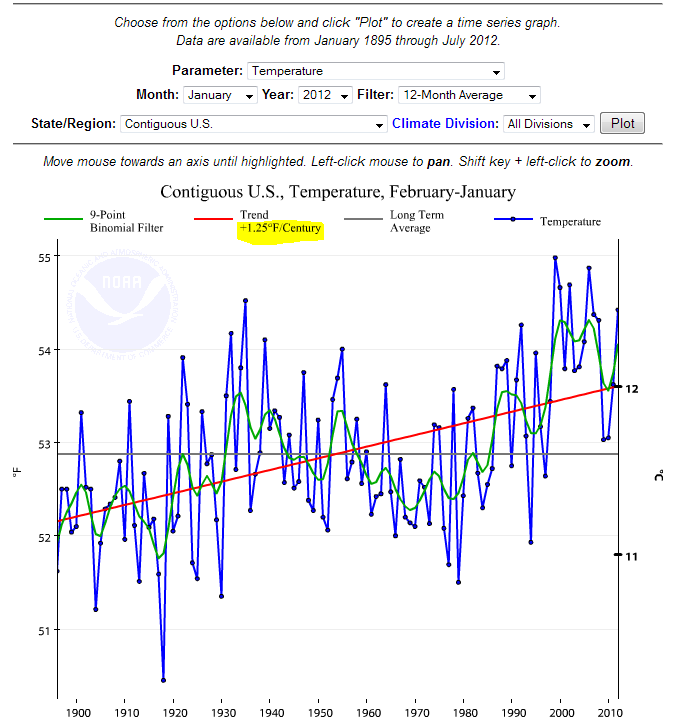 NOAA at least shows it but it is impossible to see it in the jagged graphs with straight lines through them. 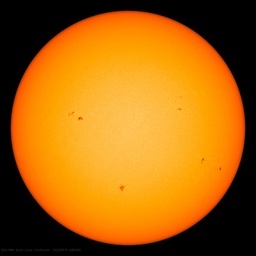 Bjørn Lomborg assigns this warming to solar influence and I agree with him. Forty percent of the century is gone by this time and there is no sign of that carbon dioxide greenhouse effect. The next part of the century is controlled by a totally different physical process. There is no warming in the fifties, sixties, and seventies while carbon dioxide relentlessly increases. People were worried about a coming ice age and newspapers and magazines had articles about it. There has never been a satisfactory explanation of why rising carbon dioxide did not cause any warming for these thirty years, just contorted hypotheses trying to explain it away. Now seventy percent of the century is gone without any sign of that greenhouse effect, and yet these bozos are drawing a straight line through it claiming warming. The eighties and the nineties likewise did not have any warming. During this period there were five El Nino peaks, with La Nina valleys in between. Obtaining the global average temperature of this period by the method I described gives a horizontal straight line almost twenty years long. I get this from UAH satellite temps, from RSS satellite temps, from Hansen’s Gistemp. and from NCDC. All unanimous: no warming in the eighties and nineties. Yet Hansen gets up in 1988 and tells the Senate that the warming has started. Checking it out we find that 1988 really was a warm year because it happened to be the peak year of the 1988 El Nino. Like I said, it is one of five El Nino peaks in that period, each one followed by a cool La Nina. The nineties ended with the arrival of the super El Nino of 1998. It is an outlier in that it is interpolated into the ENSO sequence but is far more powerful than any other El Nino before or since. With it came a step rise in global temperature. In four years temperature rose by a third of a degree Celsius and then stopped. There has not been any warming since that time. The cause of the warming is very likely the large amount of warm water carried across the ocean by the super El Nino. This, and not an imaginary greenhouse warming, is the cause of the very warm first decade of our century. The super El Nino of 1998 is still the highest temperature peak on record. Hansen has claimed a few peaks in the 2000-s higher than that but he is obviously wrong. I checked out his GIStemp and found that all these claimed peaks are erroneous outliers that should be erased from the record. And here you have it: no greenhouse warming for the last 100 years. Many have little or no expertise in climate science. Thus people who are skeptical of the Catastrophic Anthropogenic Global Warming narrative have a higher degree of scientific literacy than those who believe the narrative, and thus California Governor Jerry Brown’s website is erroneous. While some have some science background, their training often is unrelated to climate science and they have not published “peer-reviewed” scientific work in climate or atmospheric science. “Roy W. Spencer is a climatologist and a Principal Research Scientist for the University of Alabama in Huntsville, as well as the U.S. Science Team Leader for the Advanced Microwave Scanning Radiometer (AMSR-E) on NASA’s Aqua satellite. He has served as senior scientist for climate studies at NASA’s Marshall Space Flight Center in Huntsville, Alabama. “Spencer, Roy W.; Christy, John R. (1990). “Precise Monitoring of Global Temperature Trends from Satellites”. Science 247 (4950): 1558–1562. Bibcode 1990Sci…247.1558S. doi:10.1126/science.247.4950.1558. Spencer, Roy W.; Braswell, William D. (2007). “Cloud and radiation budget changes associated with tropical intraseasonal oscillations”. Geophysical Research Letters 34 (15): L15707. Bibcode 2007GeoRL..3415707S. doi:10.1029/2007GL029698. Spencer, Roy W.; Braswell, William D. (2008). “Potential Biases in Feedback Diagnosis from Observational Data: A Simple Model Demonstration”. Journal of Climate 21 (21): 5624–5628. Bibcode 2008JCli…21.5624S. doi:10.1175/2008JCLI2253.1. Spencer, Roy W.; Braswell, William D. (2010). “On the diagnosis of radiative feedback in the presence of unknown radiative forcing”. Journal of Geophysical Research 115 (D16): D16109. Bibcode 2010JGRD..11516109S. doi:10.1029/2009JD013371. “Dr. John R. Christy is the Distinguished Professor of Atmospheric Science and Director of the Earth System Science Center at the University of Alabama in Huntsville where he began studying global climate issues in 1987. Since November 2000 he has been Alabama’s State Climatologist. In 1989 Dr. Roy W. Spencer (then a NASA/Marshall scientist and now a Principle Research Scientist at UAH) and Christy developed a global temperature data set from microwave data observed from satellites beginning in 1979. For this achievement, the Spencer-Christy team was awarded NASA’s Medal for Exceptional Scientific Achievement in 1991. In 1996, they were selected to receive a Special Award by the American Meteorological Society “for developing a global, precise record of earth’s temperature from operational polar-orbiting satellites, fundamentally advancing our ability to monitor climate.” In January 2002 Christy was inducted as a Fellow of the American Meteorological Society. * Christy, J.R. and W.B. Norris, 2006: Satellite and VIZ-Radiosonde intercomparisons for diagnosis on non-climatic influences. J. Atmos. Oc. Tech., 23, 1181 – 1194. * Spencer, R.W., J.R. Christy, W.D. Braswell and W.B. Norris, 2006: Estimation of tropospheric temperature trends from MSU channels 2 and 4. J. Atmos. Oc. Tech., 23, 417-423. * Christy, J.R., W.B. Norris, K. Redmond and K. Gallo, 2006: Methodology and results of calculating central California surface temperature trends: Evidence of human-induced climate change? J. Climate, 19, 548-563. * Christy, J.R. and R.W.Spencer, 2005: Correcting temperature data sets. Science, 310, 972.
tropospheric temperature trends? Geophys. Res. Lett., 31, No. 6, L0621. * Christy, J.R. and R.W. Spencer, 2003: Reliability of satellite data sets. Science, 301, 1046-1047. * Christy, J.R., 2003: Climate Research – Response to “Wanted Scientific Leadership on Climate” by Pielke, Jr. and Sarewitz. Issues in Science and Technology. Spring 2003, 9-10. * Christy, J.R., R.W. Spencer, W.B. Norris, W.D. Braswell and D.E. Parker, 2003: Error estimates of Version 5.0 of MSU/AMSU bulk atmospheric temperatures. J. Atmos. Oceanic Tech. 20, 613-629. * Christy, J.R., 2002: When was the hottest summer? A State Climatologist struggles for an answer. Bull. Amer. Met. Soc. 83, 723-734. * Christy, J.R., D.E. Parker, S.J. Brown, I. Macadam, M. Stendel and W.B. Norris, 2001: Differential trends in tropical sea surface and atmospheric temperatures. Geophys. Res. Lett. 28, 183-186. * Winter, A., O. Tadamichi, H. Ishioroshi, T. Watanabe and J. R. Christy, 2000: A two-to-three degree cooling of Caribbean sea surface temperatures during the Little Ice Age. Geophys. Res. Lett., 27, 3365-3368. * Hurrell, J., S.J. Brown, K.E. Trenberth and J.R. Christy, 2000: Comparison of tropospheric temperatures from radiosondes and satellites: 1979-1998. Bull. Amer. Met. Soc., 81, 2165-2177. * Gaffen, D.J., B.D. Santer, J.S. Boyle, J.R. Christy, N.E. Graham, R.J. Ross, 2000: Multidecadal changes in the vertical structure of the tropical troposphere. Science, 287, 1242-1245. * Christy, J.R., 2000: Global Climate Change: Scientific and Social Impacts. Bridges. 7, 39-57. * Christy, J.R., R.W. Spencer, and W.D. Braswell, 2000: MSU Tropospheric temperatures: Data set construction and radiosonde comparisons. J. Atmos. Oceanic Tech. 17,1153-1170. * Stendel, M., J.R. Christy and L. Bengtsson, 2000: Assessing levels of uncertainty in recent temperature time series. Climate Dynamics, 16(8), 587-601. * Christy, J.R., R.W. Spencer, and E. Lobl, 1998 Analysis of the merging procedure for the MSU daily temperature time series. J. Climate, 11, 2016-2041. * Christy, J.R., R.W. Spencer, and D. Braswell, 1997 How accurate are satellite ‘thermometers’?, Nature, 389, 342-3. * Christy, J.R. , 1995 Temperature above the surface layer. Climatic Change , 30, 455-474. * Christy, J.R., R.W. Spencer and R.T. McNider, 1995 Reducing noise in the MSU daily lower tropospheric global temperature data set. J Climate , 8, 888-896. * Christy, J.R. and J. Goodridge, 1995 Precision global temperatures from satellites and urban warming effects of non-satellite data. Atmos. Env. 29, 1957-1961. * Christy, J.R. and R. T. McNider, 1994 Satellite greenhouse signal. Nature, 367, 325. So their training is “related to climate science” and they have “published ‘peer-reviewed’ scientific work in climate or atmospheric science.” and thus California Governor Jerry Brown’s website is erroneous. Many receive funding for their efforts from industries with a financial interest in ignoring climate change. Oil companies, coal-burning electric utilities, and other companies that make their profits from burning fossil fuels have funded denier organizations and scientists, just as tobacco companies funded people who claimed that second-hand smoke was safe. it appears that the Warmists have been aggressive in seeking funding from “Oil companies, coal-burning electric utilities, and other companies that make their profits from burning fossil fuels”, as well as any else with money. In contrast, I for one, have never received a dime from anyone for the work I’ve done, and I am not aware of any skeptic who has ever solicited or received funding directly from “Oil companies, coal-burning electric utilities, and other companies that make their profits from burning fossil fuels” and thus California Governor Jerry Brown’s website is erroneous. Actually, climate models are very good at modeling climate. They are less accurate when used to predict local and specific details. The models are designed to be computer representations of how our climate works. Of course, computer models have limits based on our level of scientific knowledge and computer capacity. That is true of all models, from the simplest to the most complex. Scientists are very confident in their climate models because those models have accurately reproduced past global temperature observations. They are based on physical laws, and different models over several decades have shown a similar and unambiguous picture of significant climate warming resulting from greenhouse gas emissions. Models remain valuable and essential tools for simulating, understanding, and predicting climate. “It is unclear how much confidence can be put into the model projections of the vortices given that the models typically only have moderate resolution and that the climatological structure of the vortices in the models depends on the tuning of gravity wave parameterizations. The Governors Office of Planning and Research has produced propaganda that some find….”polarizing and superficial”…..OMG ! ! ! Agree completely. The true consensus is with scientific skeptics, as the OISM Petition makes clear. Well, this is what happens when virtually no one believes them anymore. Moonbeam and his little page was entirely ignored, even by the warmists, save for Tobis. Would Prof. Hoegh-Guldberg be any relation to Rube Goldberg? I find it at least slightly humorous that California is in a cooling trend that started in 1984 or so. It is interesting to see the different trends resulting from different starting dates, for example the last 20, 40, 60 and 80 years. The content of Gov Moonbeam’s text is a collection of statements that range from misleading through defective to wrong. What a blast of ignorance and hyperbole! One must ask if Californians are as dumb and uninformed as he seems to think. And that ‘97% of scientists’ again! Don’t they check their sources? Obviously not. Remember Uncle Jerry only means well. Now you wouldn’t want to confuse people with more pesky facts – ordinary people wouldn’t get the right idea. Clearly we here in CA need James Hansen to weigh in, after all, he recognizes the problem explaining global warming to people is with the data, not the theory. Do I really have to indicate sarcasm? This very dull, stupid man is a disgrace. It is clear that CA has lost its collective sense. In fact I was talking to an investor today who wondered if Californian’s are even aware of the impending collapse of the State. For every 100,000 illegals coming in, CA is now losing an equal number of Americans. 25,000 businesses have left the State in the last 10 years for other States. It now has less taxpayers than those who pay taxes. As a minor example, American film production has gone from 70% CA made in 2001 to 16%. It is expected to virtually disappear. Entire industries are gone. Power plants and regional grids are rusting. The rest of the country is propping up the former 6th largest world economy. Now the ninth and falling like a rock. It’s a very sad kind of funny that demands we respect a politician who is actively and currently insulting us and lying to the public. How about no? Is no okay? ‘Cause I’m gonna go with no. I think that the first sentence answers the question in the second sentence…. What’s the problem? The graph is clearly labelled,head and foot. So,what’s the state of contiguous US temps since 1895,Jan to April? On the rise,it seems. And the state of the same,annually since 1895? On the rise. California? Lower trend because of maritime influence,but on the rise. The graph is not “wonky” It would be, if it was mislabelled. I tend to agree with Nick. The graphic is meaningless and misleading, but it is not wrong in itself. The only thing wrong is what they intend others to conclude from the graphic, which is not what the graphic is about. But a careful observer would notice what the graphic is about. There is no written claim about the graphic that is wrong. In fact, there is no claim at all. They expect the reader to get to his own conclusions, hoping that the reader will get it wrong by either not paying attention to the header or deciding on its own to extrapolate the result to the whole year. But the graphic is correctly labelled and has correct information, if you trust the source. I think my latest comment was inadvertently posted to the wrong article. Here it is again, this time to the correct article. In any case, a global surface temperature chart or other global indicators would be better than US surface temperature charts, to illustrate global warming. REPLY: There’s no mistaking a tennis court for a lake. That’s just your unsupportable talking/tweeting point you’ve been spreading around for denigration purposes. It is all clearly presented. One thing has aways puzzled me. Why were temperatures below “normal” for so long? (1961-90 average). It must have been pretty cold, Central England average for 61-90, (normal), was only 0.11 C warmer than the 1721-50 average and the summer average for 61-90 was actually 0.15C colder than the summer average for 1721-50. The CET 30 year average for 61-90 at 9.47 C, was colder than that for 31-60 at 9.6C. Dog-poo methane – now this … Can’t think of a worse material to string up over the Reef. All that worry about (non-existent) plastic bags being ingested by marine animals – what do they reckon will happen when the storms and swells rip up the shade cloth? Of course, they have no idea of the scale of the GBR. Well, they wouldn’t would they, since there is no evidence of climate change damaging the reef. I did notice that the trend of the California graph seemed to be unduly influenced by the start year . By eyeball the trend looks pretty flat if you start just a year later. I am surprised at reactions in this thread. A politician has selected data which supports what he wants to claim and has presented it in support of policies he wants to impose: his selection of information is stated but is an economy with the truth. Does anybody know of any politician anywhere who does not use such economy with the truth in support of the policies he/she advocates? One thing you can say about California’s Jan-Apr. graph is that it shows the thirty-year cycle rather well, and interestingly, what appears to be a current downtrend. A stock technician would draw it with channels or Bollinger Bands around it. Hopefully technical analysis for climate works better than it does for the stock market, LOL. Whoa. Perhaps I should have lived in California for a while, but I never realized there were any intelligent people who were long time admirers of Gov. Brown. I confess the main things I remember about his first pass as Governor are the Med Fly fiasco and his Moonbeam nickname, the latter not entirely warranted. I wish I knew this about Tobis before, it would have made reviewing his web site more fun. Congrats to Gov. Brown for bringing consensus to the climate blog community. Just pick the 60-month average and no other picks make any difference. 12-month average clutters up the graph with more weather. Can’t see the forest for the trees and can’t see the climate for the weather samo samo. The second mistake Brown’s office made is the team is no longer talking about the whole record. 1.25F per century? Who cares. That’s not a scary temperature rise by 2100. Not even by 2200. They need a 5F rise per century to get the scare going. They need a 0.5F/decade rise to meet Business As Usual projection in IPCC AR1. So the team tries to focus on 1980-2000 and cut it off as soon as possible after that because there hasn’t been any global warming AT ALL in the 21st century to date. That’s gotta hurt. They need 21st century climate to start warming and soon or there isn’t enough egg in Tyson Farms to cover all their faces. I agree that the Jan-Apr selection is simply sloppiness in the Governor’s office. Had they used just Feb-Mar, they could report a NCDC trend of 2.68°F, they would not have used Sept-Oct, with a trend of merely 0.59°F. Overall, no sign of blatant (or competent) cherry picking. I have to get to work, so I’ll resist the temptation to check the California data. Ah, c’mon peeps! Nothing new here: Plus ca change…. Soon I will be pres-i-dent…. Hippies won’t come back, you say? Jello Biafra sure called it! You are too kind. I don’t believe “erroneous” is an accurate descriptor for the website misinformation. Your post at August 20, 2012 at 5:59 am is risible. Choosing any set of specific months instead of annual data is ‘cherry picking’. And a politician wanting to exaggerate does so to a plausible degree. Governor Brown – and his advisors – would not have used the immense Feb-Mar trend because the datum would have been blatantly wrong and, therefore, would have gained immediate ridicule. The more politicians try and force companies to stop burning coal through economics, the more the price drops, the greater the incentive to use coal. Why not simply pass a law outlawing coal in power plants? They did it for nuclear. It fits well with projections of ridership for the high speed rail to nowhere and inversely fits with the cost revisions of the high speed rail to nowhere. Not to worry much longer though because Medicaid expansion also called free health care for the world will soon swamp the wealth system that underlies Moonbeam’s policy decadence. And yes I am coining a new term here–policy decadence defined as expensive, ill conceived policy reach based on a former base of wealth. I believe I can rephrase your quote to more accurately state my position. Seriously, this is the guy elected, a self-confessed liar, a guy who admits he has no plan? I’m gobsmacked really. Sort of leaves you nostalgic for Gov. Arnie. When will he be back? Anthony, you complained that if you made the stupid mistakes that the Governor and his team made that the press would be all over you. What you fail to understand is that no one has high – or even mediocre – expectations of any government or government official. They are politicians. You are not a politician, but rather a scientist and an expert on this subject, with a reputation for insight and keen analysis. I wouldn’t track this site if that weren’t true. People can throw poo at you and call you names, but they rarely attack the science and analysis. A good indicator that you’re on the right track: look at the quality of your core moderator team. They are quite impressive. Birds of a feather. Go ahead and complain, but inside retain the smug satisfaction of competency Hansen, Mann and other non-military government personnel and organizations can’t hope to attain. > Choosing any set of specific months instead of annual data is ‘cherry picking’. Only when done intentionally, at least in my book, YMYV. 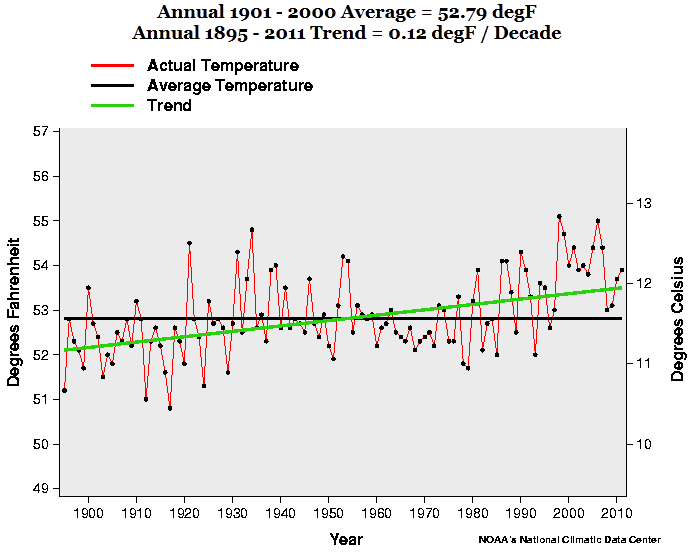 It’s pretty clear some staffer followed a link, the first graph he saw showed temperature rising, so he used it. He probably didn’t realize it was for 1/3 of the year or for 2% of the global temp, he just needed a graph with a rising trend. It appears no attempt was made to exaggerate the issue. By now, I’ve probably spent more time looking at graphs than he did. Polistra, the global mean surface temperature is very tightly coupled via energy conservation (in the physics sense, not the green sense) i.e., global radiation budget. Regions are also tightly coupled on the Rossby scale (about 2000 km.) The United States is not really a region in that sense, but the lower 48 is not a terrible aggregation of a few regions on a relatively small latitude band. So national variability is much smaller than would result from independent local records, and global variability is very much smaller than would so result. You can easily check this yourself. Your post at August 20, 2012 at 10:34 am asks me for my definition of ‘cherry picking’. I answer, cherry picking is the selection a sub-set from a set of data when the sub-set provides stronger support for a view than is provided by the full set. I assume you will say the disputed graph does not choose the sub-set which most strongly supports warming. It does not. But it indicates more warming than the annual data. The graph is clear ‘cherry picking’ in that it selects the sub-set which most supports the Governor’s position while being credible (see my post you are answering). Your hypothesis that an aid may have mistakenly posted the first graph of warming he found has no merit unless you can cite the source of the graph. I remind that the graph is part of a political statement and is not a scientific presentation: it is on a site from a politician and not a scientist. And as I said earlier in this thread, selection of information to support a view (i.e. cherry picking) is normal practice for politicians promoting policies. Simply, cherry picking is malpractice for scientists but is normal practice for politicians. And this is one of the several reasons why the practices of science and politics are mutually exclusive. I’m a fervent and long time scorner of the gube, and long for the days when he was Oakland’s mayor and therefore limited in the damage he could do to the rest of.us in this once great state. Or not, in their case …. ::sigh:: It’d be SOOOO nice to have “lazy grad students” (or even a “mistaken aide”) to blame for any mistakes I make. These researchers are supposed to be professional scientists producing professional work for ungodly amounts of money. They have no excuse for not triple-checking their work, and merit no forgiveness when they try to pass their slop onto the shoulders of underlings. Is the Berkeley BEST data reliable? …These researchers are supposed to be professional scientists producing professional work for ungodly amounts of money. They have no excuse for not triple-checking their work, and merit no forgiveness when they try to pass their slop onto the shoulders of underlings. In Industry it is generally the manager/foreman who gets fired for sloppy work along with the sloppy worker. THAT is a manager’s job, to manage the workers and catch the sloppy work. Yes, but … there’s a reason “close enough for gov’t work” is frequently uttered. It’s harder to get rid of these sloppy workers. In Oz each of our states have a motto on the number plates of vehicles. These change with different administrations “the state of excitement” “the garden state” “the sunshine state” that sort of thing. Looking from OZ your new state motto should be the “Mayhem state” or maybe the “Moon blessed state” Twenty or thirty years ago California was some thing to look up to, now not so much. Thanks to twenty years of such nonsense California is in the condition it is. Its only become worse with the senility shown by the present governer… this attempted deception being just a more recent example of the rot at the core of the state. “the collapsing cost of carbon permits means there’s little penalty for burning coal.” OMG! Carbon credits work in spite of themselves! The Invisible Hand (that forces correct pricing of goods and services) flips Angela (and every other syncophantic warmist politician) the bird.